Few people understand the origin of the money in their wallet and their bank account. Most assume that our government creates this money. In fact, the Treasury only creates a small fraction of our money - namely, the coins that we have in circulation. This accounts for less that 3% of all the money in circulation (i.e. digital money, paper notes and coins). Approximately 97% of our money has to be borrowed into existence from private banks. As a nation, we have effectively privatised the creation of our national currency. Thankfully, information is now being published that proves that banks do create our money supply. Reducing our taxes by 33%. 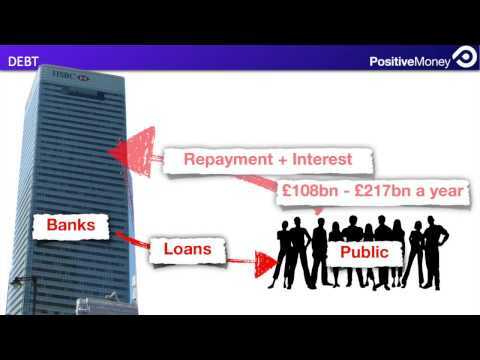 Positive Money UK have released a video 97% Owned that details the way banks create money, and the consequences thereof. Our money supply should be created by our government and spent into circulation. Our government has the sole prerogative to create our money supply. Money should be a public utility - and not a reflection of an existing debt. Our money system must exist for the benefit of all Australians - not just a select few.